LostLettermen.com, the college football and basketball site, occasionally contributes to The Dagger. 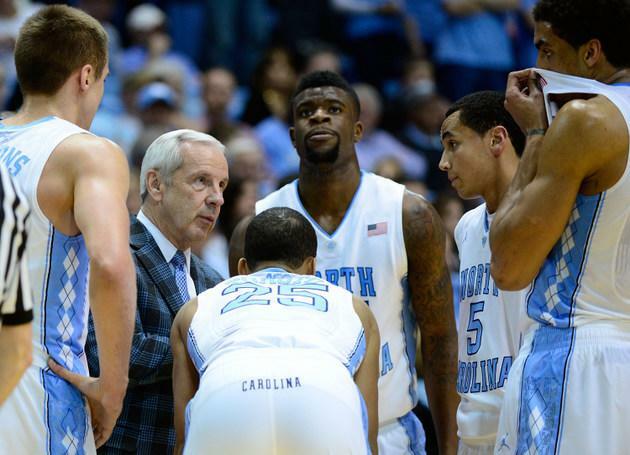 Here's its look at the history of the argyle stripe on North Carolina's timeless basketball jerseys. One look at North Carolina’s uniforms and you’re seemingly transported back to the 1950s, when the legendary Frank McGuire and his “Underground Railroad” of New York City-bred players first transformed the Tar Heels into a national power. Those “Carolina blue” threads have become the epitome of an old-school, timeless look in college basketball. It’s not just that particular shade of blue that does it, either. No other school in the sport can boast a design quite like the argyle pattern running down the sides of both the shorts and the jerseys. Logic would dictate that the argyle look dates back to McGuire. But in reality, North Carolina is in “just” its 22nd season sporting a style that is wholly unique to the Tar Heels. (During the 1980s, the Heels had a white stripe down the side of the jerseys and a Tar Heel logo on the side of the shorts). The brainchild behind the argyle look is fashion designer Alexander Julian. Prior to the 1991–1992 season, former North Carolina coach Dean Smith asked Julian — a four-time winner of the Coty Award for American fashion and a three-time recipient of a Cutty Sark Menswear Award — to redesign the Tar Heels’ uniforms. Julian boasted deep roots in Chapel Hill. His father, Maurice, opened Julian’s clothing store on East Franklin Street in 1942, where it remains to this day. Like Maurice, Julian attended UNC, as did Julian's oldest daughter. In spite of that and the various honors he had received for his previous fashion work, Julian had never faced a design challenge quite like modifying the look of his beloved hometown Tar Heels. “To have Dean Smith call you and ask for new uniforms for the Tar Heels was like having God ask for new halos for the archangels,” Julian joked to Home Accents Today. His suggested argyle pattern, he said, was “the weightiest design decision I ever made, because if I screwed it up I could never go home again." It wasn’t just Smith that Julian had to sell the merits of his design to. The coach, ever the diplomat, involved all of his assistants and his players in the decision. Rather than trying to sell each of them one by one, Julian enlisted the services of someone who could do that naturally. The program liked it even more when Smith claimed his second national title in 1993, one year after the argyle pattern first appeared. Hoping to duplicate the success of the hoops program, other Tar Heels teams such as wrestling and lacrosse have incorporated the design into their uniforms as well. Julian himself has taken the reputation he’s created with the pattern and run with it. The website of the Chapel Hill store that bears his family’s name proudly displays “Julian’s” amid a multi-colored argyle background. Now 64, he resides an hour-and-a-half north of New York City in Ridgefield, CT, and is still actively working in fashion. And contrary to his initial fears, Julian has been able to go home again. Such is his rightful reward for providing North Carolina with a look that seems timeless, even though it’s barely two decades old.